Ever since I began working with chocolate, I longed to visit a cacao farm. My first experience in Ecuador a few years after I opened my shop only stoked my desire to see as many farms as possible. I’ve since visited Colombia and Costa Rica, discovering the differences of each country’s cacao production. I’ve learned from each experience, but it’s Costa Rica that has become a second home. Cacao is embedded into the fabric of Costa Rica. Until it was eclipsed by coffee in the 1700s, cacao was a leading export. And with good reason—Costa Rican cacao beans have wonderfully deep flavor. 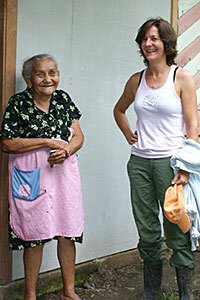 Growing cacao was a dependable way of life for many families. That all changed in the early 1980s. A disease called monilia swept through the plantations. In little over a year, cacao production was at 5% of previous levels. The cacao life was largely abandoned, replaced with pineapple, rice, sugar cane and other crops. This came at a cost to both the environment and culture. Cacao is one of the few crops that co-exists with other trees and wildlife. It sustains rather than damages the environment. When the diseased trees were cut down to make way for other crops, it displaced the habitat of howler monkeys, sloths and birds. Rural families struggled to find work for their children, who increasingly moved to the capitol and largest city, San Jose. On my first trip in spring 2008, I met Dutch farmers Hugo and Hubertien Hermelink. They own FINMAC, a model cacao farm located near Villafranca, in the north central region. The climate is hot, swampy and it seems to rain continually. Here, thanks to a reintroduction of cacao trees, a riot of nature competes for your attention—howler monkeys and sloths hang from trees while parrots squawk overhead. Hugo’s father, Ben, planted the first hybrid trees on his farm in 1985. After Ben’s death, Hugo took over the management of the plantation and continued to develop disease-resistant tree clones. He employs 28 people, providing fair wages and quality housing. The farmers’ children go to a nearby school. His farm produces organic beans and he’s dedicated to sustainable farming practices and intelligent mechanization. 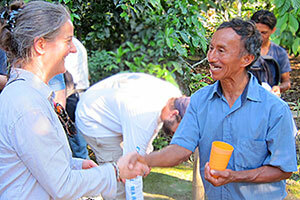 Hugo reaches out to small farmers and cooperatives to help them revive cacao in their regions. Hugo and I struck up a friendship on that first visit that has lasted ever since. I have returned several times to work with the Asociación de Mujeres Amazilia del Caribe. The wives of cacao farmers, the Amazilia women originally joined together to supplement their household incomes. After trying different ideas, they started working with organic chocolate in 2004. Today, they primarily make bars that are sold in San Jose and at resorts and gift shops catering to tourists. I have done chocolate tastings and workshops with them over the course of several trips. They’re a delightful, enthusiastic group and I’m always thrilled to see them. Another unique cottage industry has sprung from our relationship with Hugo. Local artisans are collecting the discarded bean shells and fallen cacao leaves from Hugo’s farm and making paper with them. The paper is 80 percent cacao products and it’s gorgeous. The group makes boxes from the heavy, speckled paper that we’re using for some of our products. As dark chocolate increases in popularity, larger chocolate manufacturers are increasingly interested in these farmers’ wonderful beans. There’s a potential to bring back a way of life that is good for all involved, not exploitative or damaging to the environment. Within 5 to 10 years, when the trees are productive, Costa Rica is going to be a hot market for cacao. What the farmers and their families do now will set the stage for better lives for their children and a strong new tradition of cacao. 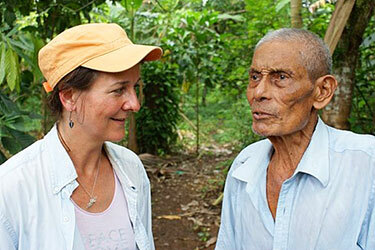 I will keep going back to Hugo’s farm, where I’ve met others who share my passion for chocolate and sustainable living. I’m proud to use their chocolate and be a small part of this renaissance.